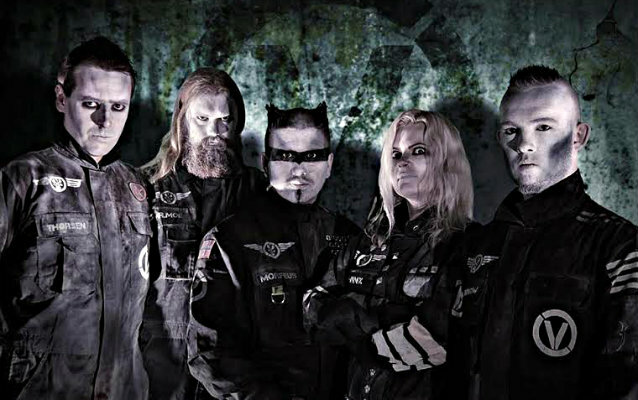 Ronny Thorsen (TRAIL OF TEARS), Miriam "Sphinx" Renvåg (RAM-ZET, ENDLING), Morfeus (MAYHEM, LIMBONIC ART, DIMENSION F3H), Endre Moe (TRAIL OF TEARS, DIMENSION F3H, CUTTHROAT) and Bjørn Dugstad Rønnow (TRAIL OF TEARS, SPHERE) have joined forces under the banner VIPER SOLFA, bringing their diverse backgrounds together to create a new brand of extreme metal. The band is currently working on material for the debut album, for which the recording process will start shortly. "Whispers And Storms", the first offering from the band, can now be streamed below. VIPER SOLFA emerged in 2013 as an idea from TRAIL OF TEARS singer and frontman Ronny Thorsen. After nearly two decades of albums, worldwide touring, as well as guest appearances for TRISTANIA and BLOOD RED THRONE, the time seemed right to head into different musical territories. Thorsen was quickly joined by fellow TRAIL OF TEARS members Endre Moe on bass and Bjørn Dugstad Rønnow on drums. Not long after, the three of them found themselves in the creative company of Morfeus, who immediately took the role of main composer as well as handling guitar, keyboard and orchestration duties. With the material at hand, it became obvious that the sound needed a diverse, intense and highly skilled female voice and after auditioning over two dozen singers from around the globe, Miriam "Sphinx" Renvåg was recruited as the final piece of the puzzle. With a lineup consisting of established and well-known members from vast musical backgrounds, the result is a merciless musical beast combining the best of the individual members' musical history. Nearly a year has been spent crafting the band's innovative brand of extreme metal, or as the band so fittingly labels it: poison music. The material for VIPER SOLFA's debut album is ready and plans are being mapped out to destroy stages around the world.